A quartz crystal microbalance (QCM) is a device that allows to measure mass with ng precision. It is based on a piezoelectric quartz substrate whose oscillation frequency changes when a thin film is deposited on top of the surface. 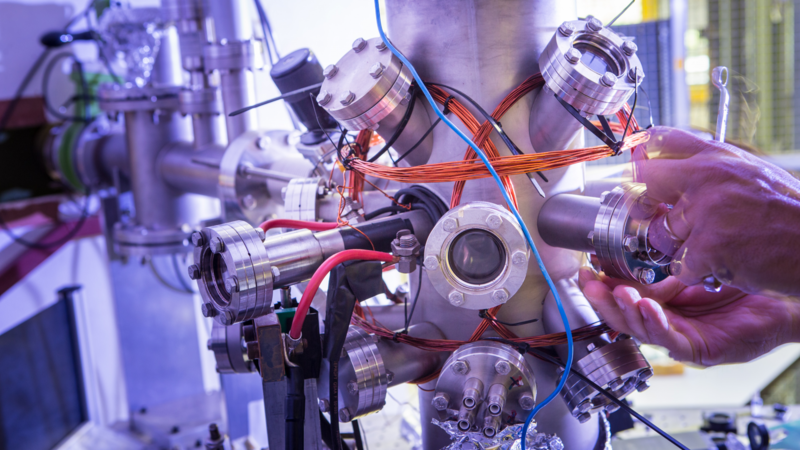 In this project this principle will be used to study the epitaxial growth of crystalline hybrid materials (metal organic frameworks) and the solubility rates of novel hybrid molecular materials for Extreme Ultraviolet (EUV) lithography applications. EUV lithography is a new technology that allows to fabricate processor chips with features below the 20 nm node. Achieving lower dimensions enables to increase the transistor density and thus the computing power of chip processors. EUV light is used to write patterns on a photosensitive material, a photoresist, that coats the Si-wafer. The parts of the photoresist that are exposed to the light undergo a photochemical change so that the products have a different solubility than the original material. By choosing the right solvent, either the unexposed (negative photoresist) or the exposed (positive photoresist) areas can be selectively washed away, thus revealing the captured pattern. In this manner, the projected optical image is transferred to the photoresist and, ultimately, after an etching step, to the Si-substrate below. Although EUV lithography is already being introduced in the semiconductor industry, there is an urgent need to find photoresists that use EUV light efficiently. In ARCNL we design and investigate new materials to learn about the correlation between the molecular structure and the lithographic performance of the photoresists. In this project, a QCM set-up will be used for two purposes: 1) measuring solubility rates of different photoresist materials to optimize the pattern formation; 2) study the deposition process of crystalline photoresist materials. The project involves the use of other techniques such as spin-coating and atomic force microscopy (AFM). In the EUV Photoresists group we aim at the design of new photoresist materials for efficient nanopatterning using EUV light. For that purpose, we synthesize model compounds and investigate their photochemistry at molecular level. The research has a strong multidisciplinary character and is performed at the interface of ARCNL, UvA and AMOLF. You have a Bachelor’s degree in physics, chemistry or biology and participate in a Master study in one of these areas. The internship must be a mandatory part of your curriculum. You have a nationality of an EU-member state and/or you are a student at a Netherlands University. You must be available for at least 6 months. At the start of the traineeship your trainee plan will be set out, in consultation with your ARCNL supervisor. A trainee contract will be established, including a small allowance.